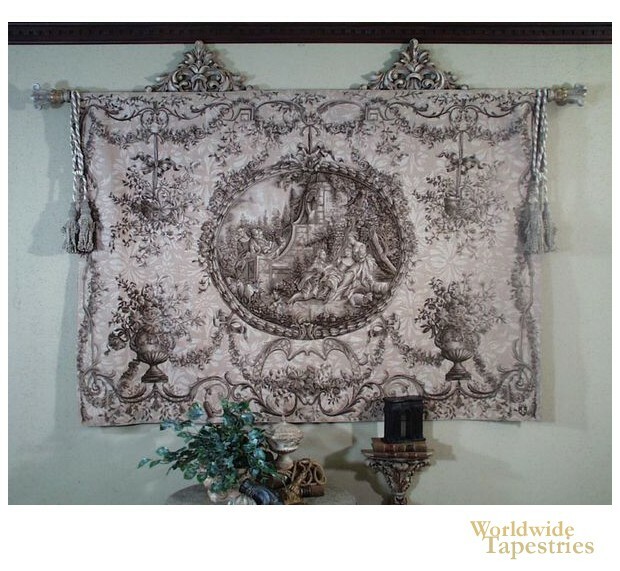 Grayness of the Evening tapestry shows a scene based on the 18th century work of Francois Boucher from the Aubusson Manufacture. The pieces from the Aubusson tapestry production house, one of the major 3 manufacturers of tapestries in France in the era were filled with intricate detail and artistry. Here we see a piece based on the design by Francois Boucher, and shows a central medallion where royalty and nobles are enjoying the countryside, and the surroundings shows urns and hanging baskets of flowers, and floral motifs, which decorate the entire work. This French floral tapestry "Grayness of the Evening" is backed with a lining and has a tunnel for easy hanging. Note: tapestry rod, tassels and accessories, are not included in the price. Dimensions: W 59" x H 43"
Dimensions: W 82" x H 58"